The Art Hop debate raging this week in Burlington isn’t just about what’s hanging on the walls, but about what’s happening beyond the canvas, at the nexus of art and politics. It’s about walls themselves — walls that protect or imprison us, walls we hide behind, and walls that separate us from one another and from the truth. To shift the metaphor: Art is supposed to cast light in the darkness. But whether this controversy generates enlightenment or just a lot of heat and smoke remains to be seen. As does who will get burned. The trouble started with a South End Art Hop installation by Peter Schumann, the 73-year-old Silesian-born founder and art director of Bread and Puppet Theater. In November 2006, Schumann visited Beit Sahour, a small, mostly Greek Orthodox town near Bethlehem in the Palestinian West Bank. For 10 days, he tried to teach Palestinians between the ages of 18 and 60 about performance art. Schumann’s goal, he tells Seven Days, was to hear Palestinian stories about the pains and indignities they’ve suffered at the hands of Israeli soldiers — checkpoint searches, home incursions, property destruction and the deaths of loved ones — and then to turn those stories into street theater. Against this backdrop, Schumann was reading The Wall, John Hersey’s famous account of the extermination of the Warsaw Ghetto Jews by the Nazis. Out of this experience, Schumann, no stranger to controversial art, created “Independence Paintings,” so named because the street performances were held on Palestine Independence Day. The paintings, done on blackened cardboard in his distorted and free-wheeling style, depict people in various states of anguish and persecution. The figures are juxtaposed with “random” quotations from Hersey’s book and descriptions of the Palestinian street theater. But critics of his installation, which premiered at Johnson State College and was later shown in Boston, have called it “anti-Zionist,” “anti-Semitic” and “soft-core Holocaust denial.” Those critics include Ian Thal, a Massachusetts-based actor, writer, puppeteer and mime. In a series of recent blog entries, Thal explains that he terminated his longtime relationship with Bread and Puppet Theater after Schumann’s piece was shown at the Boston Center for the Arts in February. Local opposition to Schumann’s exhibit was stirred up by Ric Kasini Kadour, a Burlington writer and gallery owner, who circulated emails about the piece before it had even opened. Kadour wrote an essay for Art Map Burlington entitled “Art Hop Exhibition Takes on Palestinian/Israeli Conflict — Wades into Anti-Semitism and Holocaust Denial.” In it, Kadour repeats many of the charges that were leveled against Schumann in Boston — that the piece equates the Israeli/Palestinian conflict with conditions in Nazi Germany, trivializes the Holocaust and undermines historical fact. For his part, Schumann has repeatedly denied the accusations of anti-Semitism and Holocaust denial — after all, he and his family fled Nazi Germany when he was 10. He says his critics not only misinterpret his work but “over-interpret” it. In the days leading up to the September 7 Art Hop opening, calls and emails began pouring in to SEABA’s board of directors and Art Hop staff, including several from Rabbi Joshua Chasan of Ohavi Zedek Synagogue in Burlington. In them, Chasan decried Schumann’s exhibit as “essentially anti-Semitic” and accused VTJP of “hijacking” this year’s Art Hop. Unlike some critics, however, Chasan stopped short of asking the South End Arts and Business Association, which puts on the Hop, to remove Schumann’s exhibit. Interestingly, VTJP members say they were asked by Art Hop staff to cover the windows facing Schumann’s exhibit with paper so it couldn’t be viewed from outside. And Haase’s statement in support of free artistic expression did little to assuage the event’s critics. Opposition intensified on Saturday, September 8, and quickly shifted away from Schumann’s exhibit to the Art Hop itself for its decision to give a “non-arts group” — i.e., VTJP — a public forum to advance its political agenda without providing a countervailing viewpoint. At the September 8 event — also criticized by some people because it was held on the Jewish Sabbath, when some could not attend — Schumann’s discussion of “Independence Paintings” was followed by a talk by Joel Kovel, author of the controversial book Overcoming Zionism: Creating a Single Democratic State in Israel/Palestine. Accounts of the Saturday event differ widely, depending on the observer. Supporters of Schumann and Kovel describe a group of “attackers,” numbering a dozen or two, who tried to “disrupt” the event by waving Israeli flags, badgering the speakers, muttering loudly and circulating inflammatory leaflets. 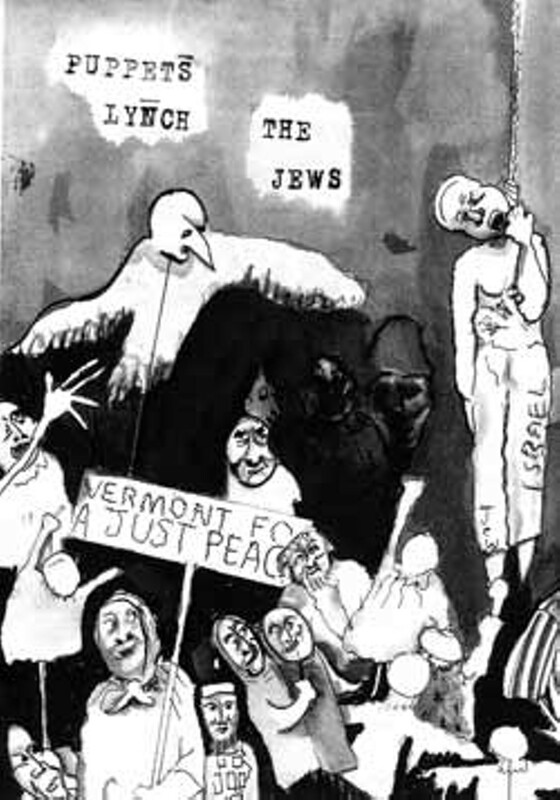 One flyer, drawn by Burlington artist David Sokol, reads “Puppets lynch the Jews,” and features an illustration of a Jew being hanged by a parade of puppeteers, presumably from Bread and Puppet. Several VTJP members and others in attendance later said they felt uncomfortable and even “physically threatened” by Kovel’s opponents. But critics of the Saturday event, including members of the Israel Center for Vermont, counter that while they were offended by Kovel’s presence at Art Hop, they behaved respectfully toward him and Schumann. Some prefaced their remarks that day by saying that Schumann had every right to present his work, but that the Art Hop was no place for Kovel’s “political diatribe” against Israel. Among those critics was Josh Neirman, a junior at the University of Vermont and president of the Chabad House Jewish Community Center. Neirman was one of several people who circulated flyers at the Schumann/Kovel talk. One flyer took aim at a Bread and Puppet performance called “Daughter Courage.” That theater piece deals with the death of 23-year-old American activist Rachel Corrie, who was killed by an Israeli bulldozer while trying to stop the destruction of a Palestinian house. Neirman’s flyers featured photos and captions depicting eight other “Rachels” who lived in Israel and were killed by Palestinian violence. From all accounts, no one — not Schumann, not VTJP and not the Israel Center and its supporters — was happy with the outcome. According to several sources, state Senator Hinda Miller (D-Chittenden) approached Haase and said she would “go after” the Art Hop’s sponsors and encourage them to withdraw their financial support for SEABA and future Art Hop events. Several other members of Burlington’s Jewish community reportedly asked WCAX-TV and other large Art Hop sponsors to pull their funding for next year. Thus far, no sponsor has done so, according to SEABA board President Mark Stephenson. An offer by Art Hop to the Israel Center to allow an opposing presentation to Schumann’s work was refused. Community anger, resentment and mutual name-calling sparked meetings the following week. Members of the Israel Center of Vermont, who met at the Burlington office of Kelleher Samets Volk on Tuesday morning, drafted a letter to the Art Hop, SEABA’s board of directors, Art Hop sponsors and the Burlington City Council. The letter attacks Kovel and his book, describing it as “anti-Semitic,” “poor scholarship” and “historically and factually inaccurate.” But the letter comes down hardest on SEABA and Art Hop. The letter then urged the board to: issue a public apology for allowing the Kovel lecture; adopt a formal policy that “only art presentations” be included in future Art Hops; conduct formal reviews of Art Hop programs before they’re approved; and open all future SEABA board meetings to the public. For their part, VTJP members also met the following week at the Peace and Justice Center to discuss how the group should respond to the criticism. Mousa Ishaq, a Palestinian-American living in Essex Junction, says he was saddened by the response to the Kovel talk, but was not surprised by the threats against Art Hop sponsors. VTJP member Bob Greene says he was outraged to witness how the Schumann/Kovel event devolved and resents the way his group has been mischaracterized by its opponents. Nina Parris says she sees something more insidious in what happened at the Schumann/Kovel presentation. Parris, who turned 80 on September 11, is a VTJP member and a Holocaust survivor. Incensed at being accused of being a Holocaust denier and a “self-hating Jew,” she thinks there are times when comparisons to the Nazis are appropriate. Underlying this week’s controversy are both the exhibit’s timing and its symbolism. Last week marked the beginning of the Jewish High Holidays, the most solemn and reflective time of year on the Jewish calendar. This time last year, many in Vermont’s Jewish community were equally outraged by a talk given at UVM by DePaul University Professor Norman Finkelstein, who speaks and writes about the link between criticism of Israel and charges of anti-Semitism. Just last week, Finkelstein announced he was resigning from the Chicago university, ending a long battle over his tenure. To some community members, the juxtaposition of these two incidents is no coincidence. Finkelstein, the son of Nazi concentration camp survivors, has also been called a Holocaust denier and anti-Semite. For his part, he has described anti-Semitism as “the Jewish race card” that gets played whenever anyone, Jewish or otherwise, attacks Israel’s policies. Others in Burlington say such far-reaching speculations entirely miss the point of this week’s controversy. While there’s a place for political art at Art Hop, they maintain, the event’s discussions and presentations should focus on local art, not advancing a one-sided political agenda. Burlington attorney and longtime political activist Sandy Baird says she’s bothered by the suggestion that art and politics can be separated and divorced from their real-world context. She also thinks there may be a silver lining to this brouhaha. On Monday night, SEABA’s board met for four hours to discuss the Schumann/Kovel controversy. Although it did not cancel the Sunday, September 23 screening of the controversial film, Occupation 101, which is also sponsored by VTJP, it refused to allow new events to be scheduled around Schumann’s exhibit. And, it formed an ad hoc committee to discuss the four demands made in the Israel Center of Vermont letter, which will report back in 30 days.